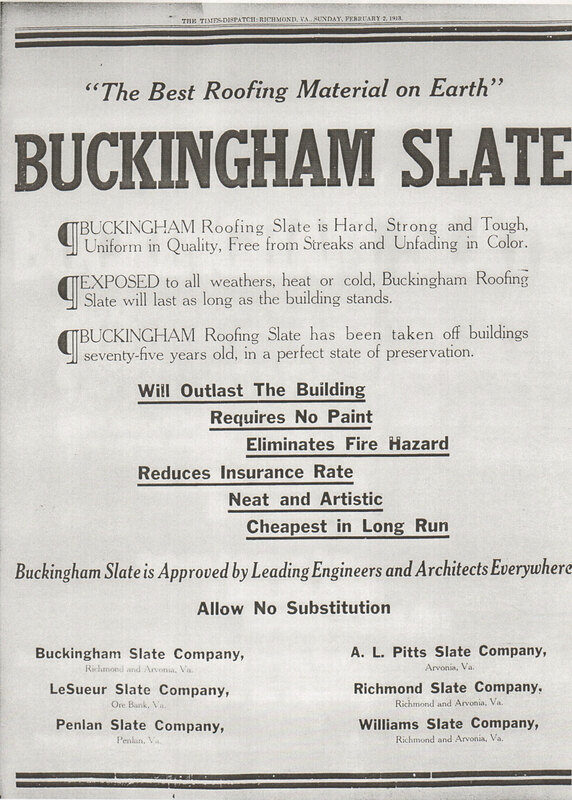 Buckingham Slate: Tops in Roofing | slate river ramblings . . . .
That claim is still in force 100 years later! In the records, 1834-1998, of the LeSueur-Richmond Slate Corporation it mentions “Williams Slate Company, Inc., founded by brothers Evan R. Williams and John R. Williams and later headed by Walter A. Chambers.” Is this the Walter Anslem Chambers we know from Buckingham? Yes, I believe this is our Walter Anslem Chambers. In “At a Place Called Buckingham,” Walter A. Chambers is pictured with workers from the quarry. See page 165.